Our pick for November 2015 in our 12 Months of Birding series on the blog is a stranger to no one: The Northern Mockingbird is not shy by any means, and can be found in a variety of places, both urban and rural. You won’t see them much at birdfeeders — their diet is mostly insects and fruit/berries. We often see them perched on the fence along the driveway or on top of the tall boxwood next to the Pool Garden at the Inn on Mill Creek B&B, singing their hearts out. And like us, they are fans of hanging out in the rose garden at Biltmore in Asheville. 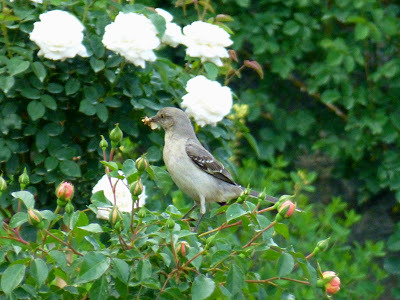 To identify a Northern Mockingbird, look for a grayish-brown medium-sized bird with a light-colored chest, stark white wingbars that can look like just a patch of white when the bird is sitting perched on a branch, long legs, a long tail, and a bill that has a little bit of a downward curve to it. As for its tune, the Northern Mockingbird has quite a playlist memorized from other birds’ songs, hence its “mocking bird” moniker. They would be great at karaoke, but they would be the type who would never leave the stage. They LOVE to sing. According to the Cornell Lab of Ornithology, a male Northern Mockingbird can learn up to 200 different songs over his lifetime. That’s a pretty long karaoke session.